Poll: Nearly 4 In 5 Voters Concerned Incivility Will Lead To Violence A new NPR/PBS NewsHour/Marist poll finds that voters are worried that the lack of a civil tone and negativity in Washington will lead to violence, but they don't agree on who to blame. 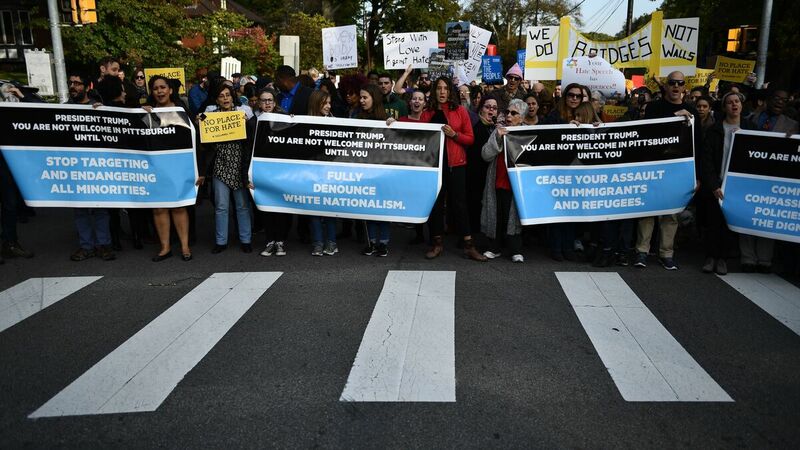 People protesting against President Trump gather near the Tree of Life Congregation, the site of a deadly shooting over the weekend, on Wednesday in Pittsburgh. More say President Trump is the most to blame than say the same thing about Democrats, the media or Republicans in Congress. Specifically, 42 percent say the president is the most to blame, while about a quarter to a third say the media are the most to blame. That finding, of course, is sharply divided along party lines. Seventy-one percent of Democrats say Trump is the most to blame. Forty-four percent of Republicans say Democrats in Congress are the most to blame with another 42 percent saying the media are the most to blame. Among independents, 45 percent say Trump is the most to blame and another 30 percent say the media are the most to blame. When it comes to the improvised explosive devices mailed to prominent Democrats and critics of the president, the results are similar — 37 percent of Americans blame the way Trump conducts himself, 21 percent say it's the way the media report the news, 12 percent say it's bickering between Democrats and Republicans, and about a quarter say it's none of these factors. But those numbers are largely reflections of consistent strongly negative feelings toward the president. In polling beginning June 2017, roughly 4 in 10 Americans have said they strongly disapprove of Trump. It's no different in Thursday's poll. The president has just a 41 percent approval rating overall, with 52 percent of voters disapproving. And 39 percent of voters strongly disapprove. It is notable, however, that one thing does cross party lines — the belief that the overall tone and level of civility in Washington, D.C., between Republicans and Democrats has gotten worse since Trump was elected. About three-quarters of voters overall say so, and that includes nearly two-thirds of Republicans. President Trump speaks to supporters during a rally at the Southern Illinois Airport last week in Murphysboro, Ill.
Those numbers are similar to polling in July 2017, when 70 percent of Americans said the tone in Washington had gotten worse under Trump. That's far higher than those who said the tone in Washington had gotten worse under President Barack Obama by the summer of 2009. A survey conducted by Gallup for USA Today in July 2009, when Democrats in the House first revealed the Affordable Care Act, found 35 percent believed the tone had gotten worse; 42 percent said it had stayed about the same. When it comes to the suspicious packages, neither the president nor the media fare very well. Fifty-two percent of voters said they think the president has not acted responsibly in his handling of these incidents, and 50 percent of voters also said the media have not been acting responsibly in its reporting of them. Those answers are predictably split along party lines — with 83 percent of Democrats saying the president has handled the incidents irresponsibly, and 72 percent of Republicans saying the media have reported on them irresponsibly. In this last NPR/PBS NewsHour/Marist poll before Tuesday's elections, it's worth noting that, overall, the fundamentals of the election have not changed. The president's approval rating has remained very consistent — and historically low compared with that of other presidents. And the latest results of the so-called generic ballot question of whom people are more likely to vote for in their district: Democrats lead. Among all registered voters, Democrats led by 6 percentage points (50 to 44 percent), but among likely voters, the Democratic advantage is 9 percentage points. 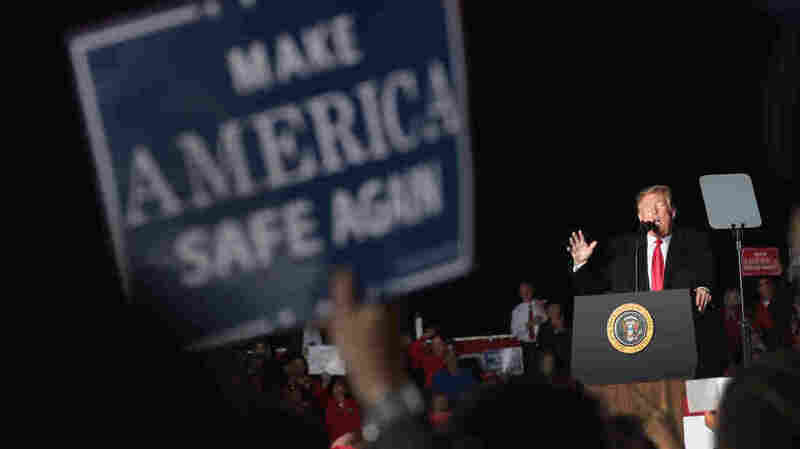 That is a range that can mean trouble in the House for Republicans, said pollster Lee Miringoff, director of the Marist Institute for Public Opinion, which conducted the poll. "Those are numbers Democrats need," Miringoff said, adding, "That's likely to convert to a flip of the House." That's especially true if midterm turnout is as high as is expected Tuesday. But because the landscape in the Senate favors Republicans so heavily — with races being run in far more states that Trump won in the 2016 presidential election where Democratic incumbents are now defending their seats — there's the strong likelihood of a split result. The possibility of a blue wave in the House and a red wave in the Senate would have both parties and the president vying for control of the national political narrative heading into the 2020 election cycle. The poll was conducted from Oct. 28 through Oct. 29. Pollsters interviewed 924 Americans, and the poll has a margin of error of 4.2 percentage points. Of those, 822 were registered voters, and answers that refer to voters have a margin of error of 4.4 percentage points.